Our friends over at Aspiro Music just released a major upgrade to their streaming music service WiMP, and made us very happy in the process. 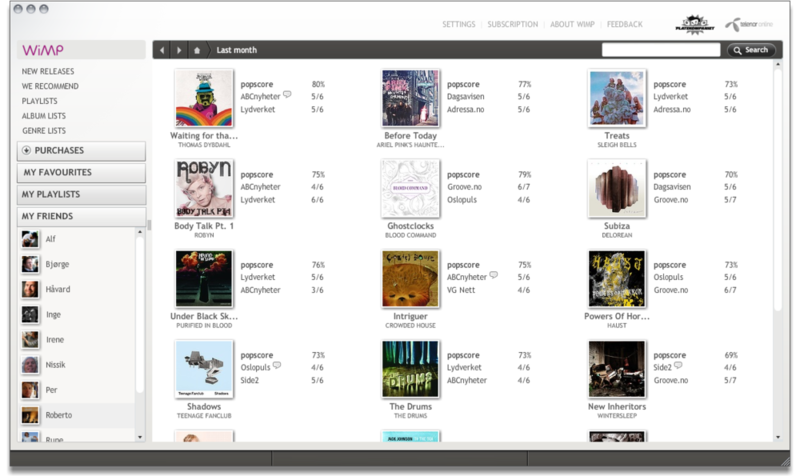 In addition to stuff like Facebook integration, WiMP now features easily browsable album lists based directly on review data from Popyoular.The WiMP-guys have used the built in toplist functionality in Popyoular to create a number of review-based lists from different perspectives: Some focus on time, like the list showing the best scoring albums of the past month. Others focus on a specific source, like the one showing the best reviewed albums from Pitchfork. For WiMP, this is a simple way to expand their arsenal of quality focused, editorially driven recommendation tools. For us, it's a great example of how the Popyoular platform can help businesses create new ways for their customers to discover more great content. It's also a perfect showcase for how Popyoular lets any site or service easily tap into the power of human content curation in a large-scale, systematic way.